In just 20 minutes, you'll leave the crowds behind without losing the beauty you enjoy in The Park! Discover why we're the #1 Rated Good Sam Park anywhere around Yellowstone. Make your Reservation request today online! We actually stayed July and August 2018. It was our first time to stay at Red Rock, and we loved it so much we’re staying June,July and August this year. We can’t wait to get back to Red Rock. Everyone there made us feel like we were family. The peace and beauty of the park and surrounding area just recharges you. If you just want to kick back, relax and reflect, this is your place. The sites are perfect and provide all you need to set up. The Park has first rate amenities. A nice out of the way park with very friendly staff. Beautiful surroundings and very quite. The sites are level with plenty of space from your neighbor. It is about 25 minute drive to the west entrance to the Park. The checkin process and staff were excellent! There were no 50AMP available. Check your AC power because we discovered our 30AMP receptacle was unable to deliver proper current (and overheating), no damage to RV because after discussion with staff, power was swapped with another trailer with lower power needs. Rock drives were extremely 'dusty', otherwise, facilities are clean, up to date, new sites and a 'clubhouse' being constructed and the 'ownership' of the park by staff was excellent! Website provides excellent overview, mileage and info about the local attractions. When the dust and electrical concerns are addressed, this will be a 5 Star for us. Our stay at Red Rock was made more wonderful because of the friendly managers of this campground. One couple actually lent us their own hiking guide to Yellowstone. Exceptionally clean facilities as well as a beautiful location with tremendous views. We will be back. I was so looking forward to staying here after reading reviews and seeing the website, but upon arriving, my bubble burst. And we were here 4 days to see Yellowstone and to fish. First of all- no view of Henry's Lake, but gorgeous views of the mountains nearby in the opposite direction. The RV sites are short! and very close together with trees trying to grow between the trailers sites. Some sites had shared green space with campfires, but we did not get one of these. Our site had an overgrown tree right by our door so it was hard to get out of the door. The slide-out on the other side was very close to the electric hook up, but we couldn't move the trailer back or forward because the site was very short. Yes the site covered the length of our 27' trailer, but all the sites looked short. Everyone had to parallel park their trucks in front or behind the trailers on the dirt road and also sometimes move them to let other motor-homes and trailers go in and out. This campground has additional space which they will probably use for expansion. I hope they make the sites longer and with more distance between the sites. Also, of all the RV campgrounds we visited on this trip (12 in 6 different states) this one had the worst wifi. They ask the guests only to use it to check emails; well, that didn't work either. For the price one pays, they should think of cable like so many RV parks used today. Take your own "hot spot" if you stay here. The people were extremely friendly and the laundry room very clean. They had newer looking washers and dryers, but wanted $3.00 a load. They said the washers were big, but no bigger than the one I have at home. Most RV resorts only want $1.50- $2.00 a load. Also, the sewer drain was raised up very high which is difficult for emptying your grey and black water tanks. The best thing about this place is the view. It truly is breathtaking. However, the excessive rules and lack of amenities makes this a huge disappointment. I had to ask for a picnic table and they said they're out of fire pits even though there are ones on empty lots and were not willing to help. Who camps and doesn't have a fire pit at their campsight? Office closes at 7, registration at 6 so not the place if you are traveling in late. Signs around the campground state to be quiet --not at night mind you but all the time. Now, we're not loud and we keep to ourselves but keep quiet at all times? The "store" has shirts. Period. Not even ice and it's 20 minutes from town. The shower has rules on ensuring you clean the shower walls after use and clean out the drain so that your hair isn't in the drain and shower lenght is restricted to 10 minutes. Internet is 500mb per campsite and their rules state that the internet is "NOT" for entertainment purposes. My husband and I went to the grocery store and left our teens at the camper. As soon as we pulled in, the owner came straight to us and complained that we had left our awning down and the camper unattended which we had not done as we had teenage children still at the camper. The owners have A LOT of rules, many mentioned here, that are above and beyond what you would normally see at a campground. I would not recommend this campground to anyone. We made reservations over a month earlier before our arrival. The day before our arrival we were informed that our spot was still in use from medical issue. They would provide us with a " best spot on . the lot" for no additional cost. We had requested a pull thru, we got a drive in which required us backing out of the spot onto a grass with our car dolly to exit. The lot had a lot of mud and lacking proper amount of gravel. We were constantly dragging junk into the unit. The waste disposal drains were at an angle which made empyting difficult. I had asked if I could wash the vehicle off and was told I could not because it could erode the gravel, what gravel. To make matters worse the next unit over was washing his on the lot. The mgt said they would help us get out when we left but there was not a body available as they donot open till 9AM, we left at 8AM. Beautiful location only 20 minutes from West Yellowstone. Campground is clean, attractive and perfectly located for folks with dogs who want to let them run outside the grounds to get some exercise. Spent almost 2 weeks there. Excellent staff, clean laundry facilities and great, peaceful place to come home to after long days hiking in Yellowstone. No cable TV so bring a satellite dish if you need that kind of entertainment. 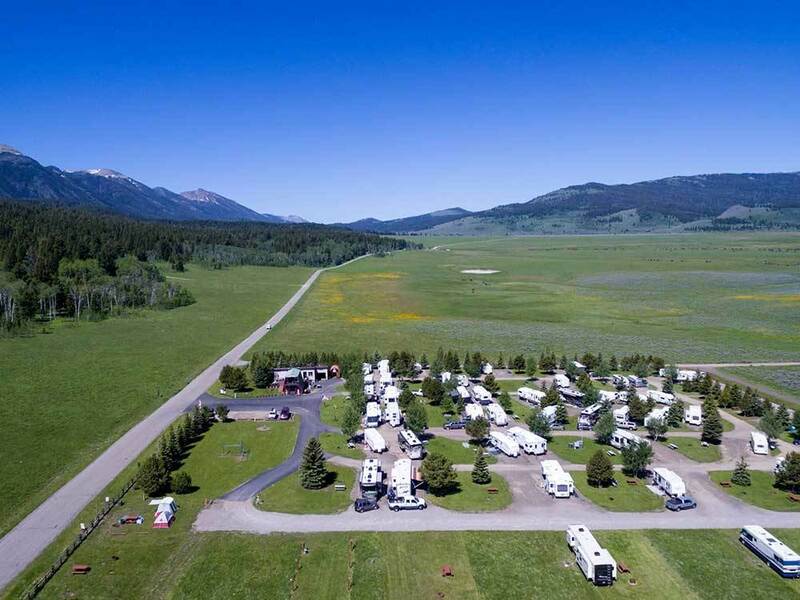 We have stayed here every year since 1993 and look forward to seeing the improvements that take place behind the scenes every season ...be it the top notch shower house and always clean restrooms to the fully stocked and newly remodled store to the very friendly and knowledgeable staff and owners of Redrock...this is my favorite RV park in the Yellowstone area ...the owners know of all the good ATV rides and the best way to fish on Henry's Lake...as well as the best Restaurants in the Island Park and West Yellowstone areas...they take great pride in their park as it shows and the dog walk is a great addition so Fido gets his much needed exercise and it has always been kept clean thanks to the other campers as well as having waste bags and containers provided by the campground staff...I have stayed in several different sites in this park and they all are A plus compared to other parks with their grass, firepits , trees , picnic tables and level , clean sites...Looking forward to my next stay again this year. When I called about a week prior to make reservations for 5 days at the Park, I indicated that I was coming to fish at Henry's Lake for trout, which is down a short gravel road from the park. The rate was over $50 a night, Good Sam rate, which was high in my estimation for a CG over 20 miles from Yellowstone. Fishing was my goal, so I was willing to pay the price. We toured around, and were planning to fish on day 3-5. We picked up a local paper on Day 2 and much to our amazement, the main article was about the deadly bacteria growing in Henry's Lake. The article warned not to get on your body or eat the fish. We immediately returned to the CG office and asked them about this being in the paper for several weeks. The lady who was the owner said she had "just" received notification of it, but did not want to alarm he campers, so she had not notified anyone camping. I advised her since the main reason for camping there was not available, we would be leaving the next morning. She said fine, but there would be NO refunds for the remaining 3 days, as had been advised when I checked in. I informed her there had been no mention of this, and that Henry's Lake was my main reason for staying there as I had explained when making the reservation. There had been no mention of Fishing problems there during reservations or check in either. She said I would have to fish elsewhere, but there would be no refunds. I informed her that I did not travel there to fish elsewhere. I feel this Facilty was aware of the problem, and took advantage of it. My wife and I travel a good bit and do not normally have any problems with Good Sam CG's anywhere in the USA. I do not consider this a Good Sam CG and Will Not Ever Stay Here Again. PROS: Staff friendly and helpful, not owner. CONS: Too far from Yellowstone and town. 5 miles off Main road. Sites small and not very level. Had to cut several tree limbs to get site ready to park. Slides against trees when out. Deceptive and unethical practices. Too costly for CG location and lack of amenities. Store items are double or triple cost of elsewhere. Don't ask for refund. You won't get it for any reason. Quiet and wonderful place to stay. We had planned an extended stay but due to a family emergency our stay was interupted for a few weeks. RR was very accommodating. We enjoy the owners and staff greatly and plan to return next year for another extended stay. The beauty of RR is the proximity to Henry's Lake, Quake Lake, Hebgen Lake and Yellowstone without the traffic. This is a nice, quiet, out of the way park. The staff are awesome. They are there to help any way they can and are very friendly. There is a grocery store in near by Island Park for those quick grocery trips. It is close enough to Yellowstone to be able to drive back and forth. I would highly recommend this park! This is a great park to stay in. They are off the main highway and it is very quite. They do allow ATV's to enter and exit from your site and their are plenty of trails to ride. The owners are very helpful in every aspect from helping you park to showing you where you can ride your ATV's. Most of the sites are very roomy. There is no pool. The restrooms and showers are kept immaculate. If you are planning a trip to Yellowstone this is a great place to stay while you make day trips into the park. We have stayed here several times and we will continue to stay here whenever we go to Yellowstone. Our last stay was actually July of 2014 but that option was not available to select. We stayed for a week in this idyllic campground. On the south side of Henry's Lake, we roamed from Idaho to Montana to Wyoming through some of the most scenic areas in the U.S. Red Rock is rustic (poor cell coverage, no cable, no propane on site), but clean and friendly. You come to this part of the country for the Back-to-Nature experience--Red Rock provides that more than any other RV park we found either in the Park or out. ATV/UTV right from your campsite. 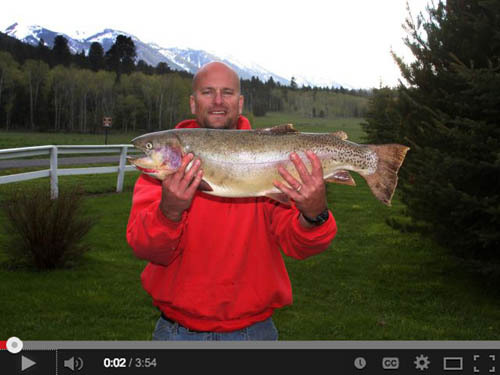 Or fish in Henry's Lake or many surrounding mountain streams for trophy trout! Short hikes to extended backpacking trips are abundant here. You won't be disappointed with our outdoor variety! Minutes away from Yellowstone Park, Wildlife Refuge, the Tetons & more. We even offer guided nature tours! There is something for everyone and so much to see & do. Come relax and enjoy our majestic views & fresh air!